Today, I would like to report about the GPAC2011 in Taiwan. GPAC is a contracted expression of Global Partnership of Asian Colleges. This is an academic forum organized by some 7 to 10 universities of 5 to 6 Asian countries. This forum has been held annually for the last 21 years. 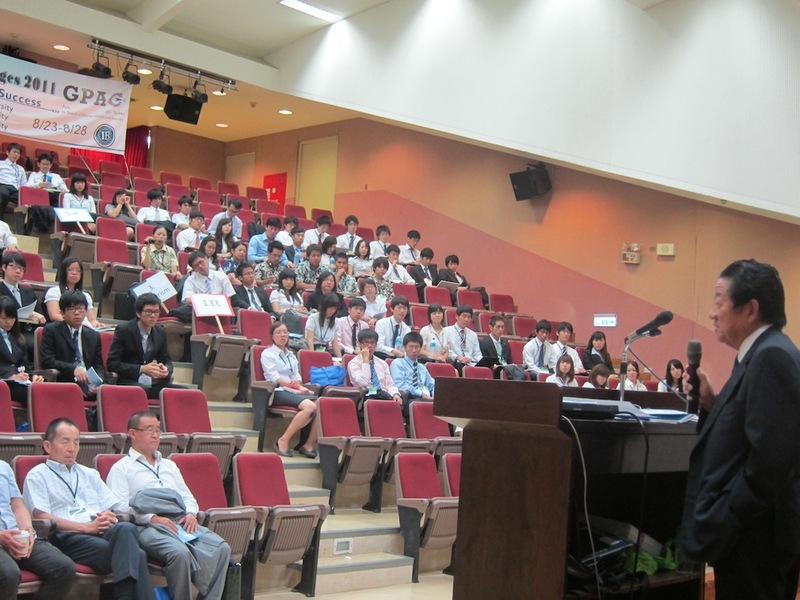 Each year, one of the universities hosts the conference of all the participants. This year, the meeting was held in Taiwan by the sponsorship of National Chengchi University for the period of August 23 to 28, of which days 25 and 26 are the core dates of academic presentations and competition. 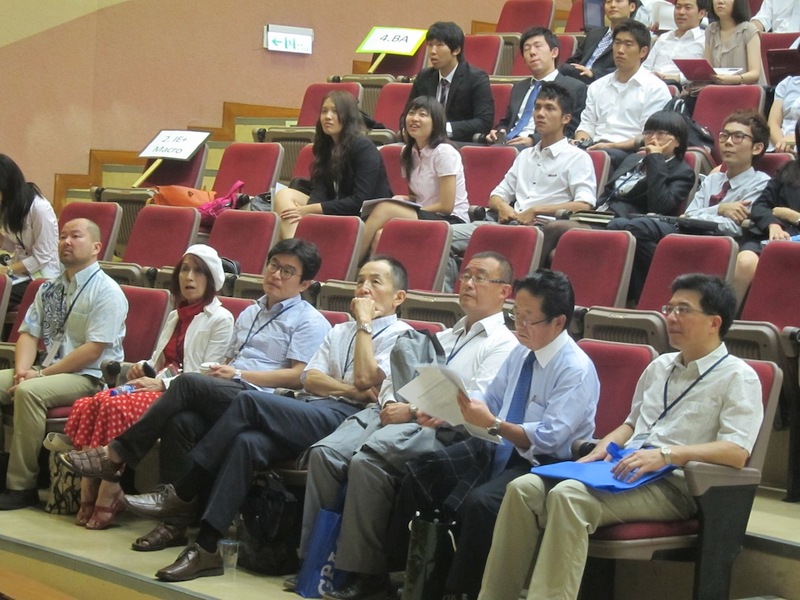 The meeting this year was attended by 7 universities of 4 countries. National Chengchi university of Taiwan, Seoul National university of Korea, Vietnam national university of Vietnam, Keio university, Meio university of Okinawa, Chiba University of Commerce of Japan. Altogether 127 students and 11 professors participated. The format of the program is in fact spans a few to several months of preparation and a week of assembly at the host country. Usually, sometime in spring, the participating universities start preparing for the conference using internet communication with other universities across borders. The host university team is responsible to determine finally the agenda and the suggested contents of the program after consulting with other teams of participating universities. This process takes several weeks to a few months. This itself provides an unique and good training for students. Having determined the agenda, students prepare papers and submit to the host university where the papers are compiled in a CD. Usually, in the final week of August, the conference is held at a certain campus of a certain country. Participating students gather together from various countries and start a week program. First, they enjoy sport events and city tours to get to know each other and make friends, whom they so far only knew with each other by internet communications. After spending two days of such introductory activities, they are then organized into multi-national teams for each subject of agenda, and study intensively together to construct a joint content of their presentation. This is a very challenging task because students of different countries have to integrate their logic, evidence, assertions and conclusions on the basis of quite heterogeneous previous preparations. They discuss earnestly overnight without sleeping and finally come up with beautifully integrated thesis, which they present orally using powerpoint visual aids at a plenary session in the first day. This presentations are usually harshly criticized by professors and other participants. Presenting teams take it back to their rooms and spend another night to correct errors, strengthen logics, and prepare more effective presentation. On the second day, they provide final presentations in the final plenary session. Usually, their presentations are improved marvelously. The students capability of brushing up their work is amazing indeed. This process seems to have a very powerful educational effect of empowering students' intellectual capability. This has been the format practiced for the last twenty years. 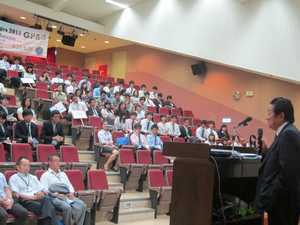 This year, Taiwan team which hosted the conference introduced an interesting innovation. This is an idea of competition among teams for the given topics. The organizing team provided three questions about a week before the GPAC meeting:(1) impacts of the development of smart phones to Asian IT industries, (2) pros and cons of common currency regime for the Asian region, and (3) what merits can Asian business and industries enjoy taking advantage of China's new 5 year economic plan for 2011 to 2015. Students are grouped into 4 teams for each question, thus altogether 12 teams. In the first stage, the teams present their analysis and policy proposals in a plenary session of the second day. Professors grade each of presentations with 4 point score scale, and on the basis of the grading the winner for each of the three questions are determined. In the second stage, the three winners present the essence of their ideas in short expressions, and all the participants, both students and professors, vote to determine the grand champion. This competition game gave students many elements of training and challenges. They worked hard for a preceding week in searching information and analyzing issues. They have to make up a small multi-national team for each question when they get together in Taipei. They had to discuss in depth and consolidate their heterogeneous ideas, and present in the most effective way at the plenary session. All the participants were excited to rank the presentations and learned much by listening of various different ideas presented by different groups. The GPAC gave students an excellent learning period as well as an unique opportunity to make friends of different countries. This experience must be a valuable asset for them to develop their capability for the future, as leaders of many spheres of Asian community. 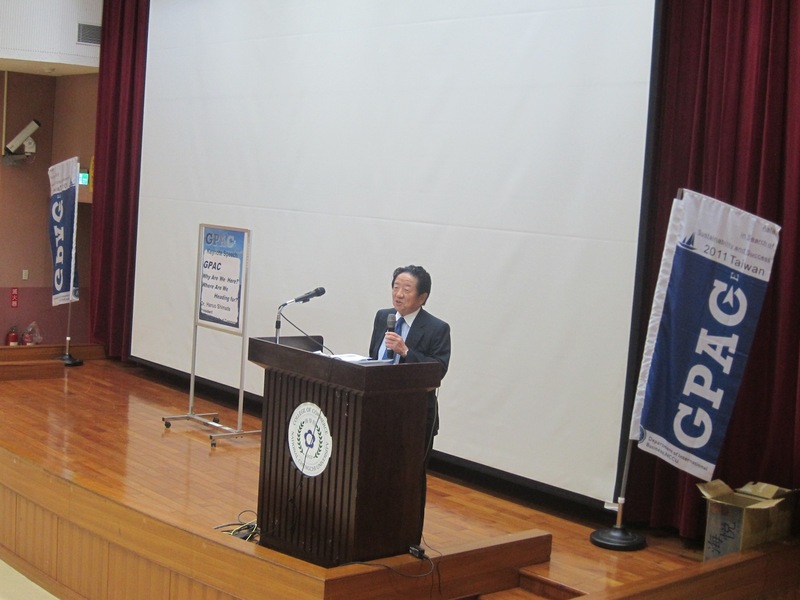 It was agreed during the session that the GPAC 2012 will be held in Seoul and GPAC2013 will be held most likely in Okinawa. We look forward for the continuous development of the GPAC activity for the future. Now,I know The GPAC gives students an excellent learning period as well as an unique opportunity to make friends of different Asian countries! And I know it would be an extension of Simada Seminar.